The fine powderlike material consisting of pollen grains that is produced by the anthers of seed plants. This is not the bad pollen. Pollen is made by seed plants. It is the male reproductive part of the plant. Without pollen there could be no more plants. We would have no more flowers, trees, fruit, or vegetables. Bees depend on pollen to survive. 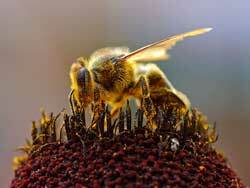 They use pollen to make honey. We all love honey, right? Well without plant pollen, there would be no more honey. There are two kinds of pollen producing plants. Entomophilous Plants: The pollen of these plants is distributed by animals. Anemophilous Plants: The pollen of these plants is distributed by wind. Generally it is the pollen from the latter kind of plants that cause pollen allergy symptoms. This is commonly refered to as hay fever. Plants that depend on the wind to carry their pollen typically produce huge amounts of pollen. Since the wind is random, it takes much more pollen to ensure that flowers will get pollinated. This is good for flowers but bad for anyone with pollen allergies. The pollen produced by these plants is also small. It has to be small in order to be carried by the wind. The average size of these pollen grains is 25 microns. They can range in size from 6 microns to 200 microns. For comparison a human hair is 40 to 120 microns. The picture on the left shows ragweed pollen under an electron microscope. This is an example of a wind borne pollen. Wind borne pollen can be carried great distances. There are very few places where it cannot be found. It has even been found hundreds of miles out at sea. Plants start producing pollen in spring and continue until fall. Different plants produce pollen at different times of the year. Since pollen is seasonal, we can say we have an allergy season. We can predict when we will have pollen allergy symptoms. During pollen season, most local TV stations release a local pollen count. This is a measurement of how much pollen is in the air. The higher the pollen count the worse your allergies can be. In addition to asking "What is pollen?" we should also ask "Which plants cause allergies?" Contrary to what many people believe most commercial flowers do not cause allergies. It's safe to keep tulips, roses, daisies, etc. The plants that cause most allergic reactions are trees, grasses, and weeds. Trees: pine, birch, cedar, hazel, and willow. Grasses: bermuda, rye, timothy, and blue grass. Weeds: ragweed, plantain, mugwort, and sorrel. One of the most common pollen allergen is ragweed. Even if it is not at fault everyone still blames their allergies on it. Ragweed pollen is most prevalent during late summer and fall. It grows all over the place and almost no where is safe from it. The big pollen that is easy to see is not what you should worry about. The tiny pollen you can't see is what causes problems. Leave What is Pollen Page and Return to Air Purifiers, Asthma, and Allergies Page. Leave What is Pollen Page and Return to All About Air Purifiers Home Page.